Scoop it up with this high-quality, lightweight tool. Aluminum and ash design makes short work of snow removal, mulch spreading and sod moving tasks. Non-sparking, naturally rustproof blade. 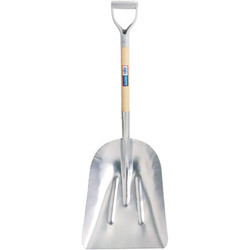 Tool Type: Shovel; Application: Cement/Concrete Working; Clearing Snow; Farming; Forestry; Gardening; Landscaping; Pipe Fitting; Applicable Material: Cement; Clay; Concrete; Grain; Feed; Gravel; Mortar; Refuse; Seed; Slush; Snow; Sod; Soil; Stone; Style: Square-Point Scoop. Shovels, Spades and Parts from Jackson Professional Tools! 164 In Stock today.